Valuing People in Construction provides contemporary perspectives on the ‘glue’ that binds the construction process together; people. The book addresses people issues in the construction industry where behavioural outcomes impact upon business and project performance. The main proposition of the book is that as people continue to lead the completion of construction activities, their health, safety, and well-being should be seen as a priority, and valued by stakeholders. As employers and employees, the role of people in construction must be to strive for the improvement of individual lives and society. 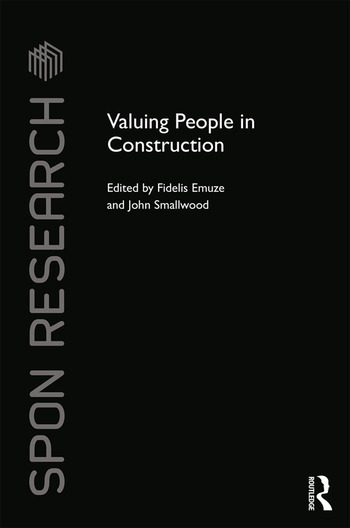 This edited collection, which is the first book to focus specifically on placing value on people in construction, focuses on people at work, gender at work, conditions at work, and respect at work. In addition to an editorial overview, the book presents tested and refined empirical work and case studies by leading construction researchers from Africa, Australia, and Europe. Essential reading for researchers, students and professionals interested in construction management, the sociology of construction, HRM in construction, gender, work and health studies. Fidelis Emuze is Associate Professor and Head of the Department of Built Environment, and Head of the Unit for Lean Construction and Sustainability at the Central University of Technology, Free State, South Africa. Lean construction, health, safety, and well-being and sustainability constitutes the primary research interest of Dr Emuze, who is a member of the Association of Researchers in Construction Management and the Lean Construction Institute. Dr Emuze is the Coordinator of CIB TG59 - People in Construction task group. John Smallwood is Professor of Construction Management at the Nelson Mandela Metropolitan University, Port Elizabeth, South Africa. Both his MSc and his Ph.D. (Construction Management) addressed health and safety (H&S). He is a National Research Foundation rated researcher specialising in construction related issues such as H&S, ergonomics, and health and wellbeing. Dr Smallwood is the immediate past Coordinator of CIB TG59 - People in Construction task group.